Jobs.ac.uk, the UK based online careers and jobs bank for universities, research institutions, commercial and public sector employers, has announced a new tool in its repertoire. 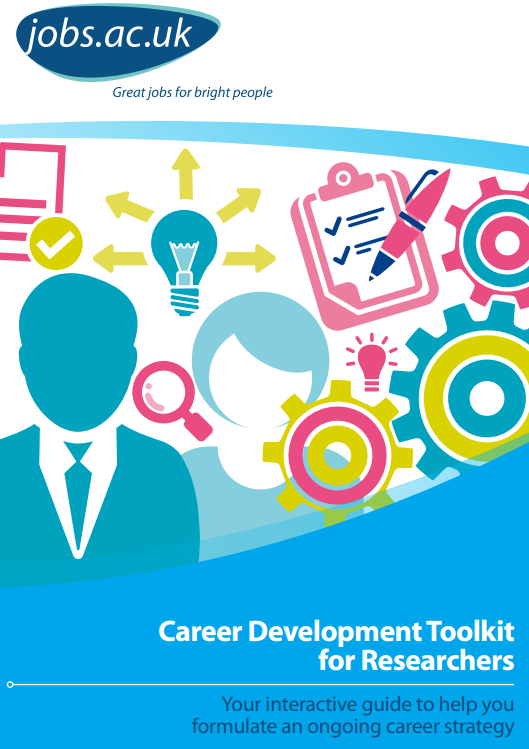 It’s an excellent Career Development Toolkit for doctoral students and research staff, written by Clare Jones, an experienced researcher careers professional at the University of Nottingham. The planner is in three parts. The first, “Stop and Take Stock”, helps you to review your career and your experience to date. The second focuses on career development in academia and offers prompts for career analysis, along with suggestions for future actions. The third looks at options in non-academic careers and helps you to identity possible routes and openings. Jobs.ac.uk offers career resources and a jobs bank for positions in academia, teaching, research, managerial and administration. You can instantly search 1000’s of jobs worldwide and learn of many resources to boost your career development. So if you are looking for a job in academia or research, for commercial or public sector employers this is the place to register. Posted on January 29, 2015, in Researcher careers and tagged career development, Clare Jones, Early career researchers, Postgraduate research students. Bookmark the permalink. Leave a comment.